Developing cybersecurity resilience in UAE. | Fleming. Developing cybersecurity resilience in UAE. 28th September 2016: The massive success of digitization initiatives in UAE have brought with them an added and growing exposure to the risk of cyber attacks. These attacks have over time intensified and can lead to potential derailment of the digitization progress in the country. UAE is a potential fertile ground for cyber crime, with its wide use of technology and high value targets. Recent high profile cyber attacks in UAE and the Middle East like Trojan. Laziok (2015), Operation Cleaver (2014) and the Suadi Aramco virus attack in 2012 have exposed the underlying vulnerability of the region's cyber security infrastructure. A KPMG report on cyber security claims that UAE is on the list of top 10 destinations targeted by cyber criminals and cyber threats have been growing across key sectors like financial services, oil & gas, technology, government, retail, construction and healthcare. It is alarming how most IT departments in the country do not have a clear view of their cyber risks due to erratically implemented cyber monitoring and threat intelligence.In lieu of the thriving threat landscape engulfing the region, The Middle East cyber security market is expected to be valued at US$9.56 billion by 2019 with an estimated Compound Annual Growth Rate (CAGR) of 13.07% from 2014 to 2019 according to a recent report of Frost & Sullivan. Meanwhile, UAE is one amongst the frontrunners in cyber-security readiness globally, as the region's network security spend is expected to grow from $340 million in 2012 to $1 billion by 2018. As organizations in UAE seek to shore up their defenses against increasingly intelligent and determined hackers, innovative cyber security solutions are in high demand. 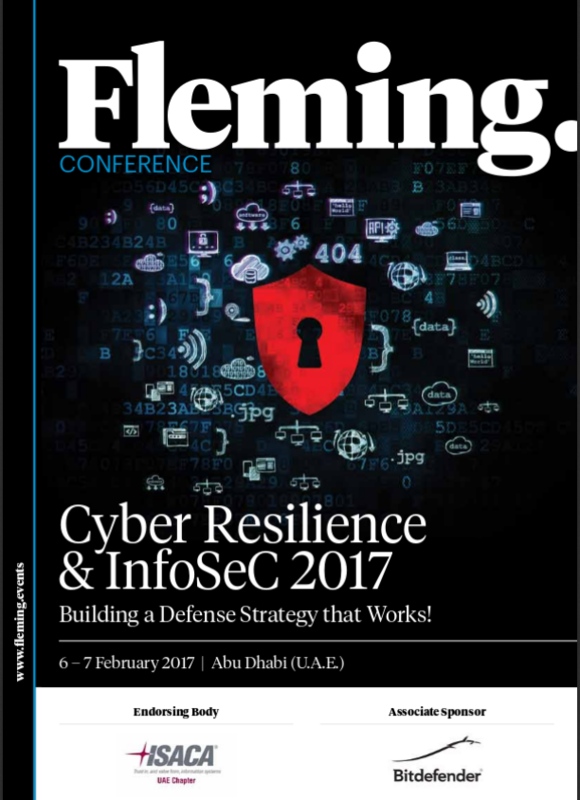 Fleming's Cyber Resilience & InfoSec Conference 2017 will bring together global cyber security leaders, leading IT professionals and regulatory experts from around the globe. The two day conference will focus on creating and promoting effective strategies that aim to strengthen and secure the existing IT infrastructure in the region. This edition of Cyber Resilience & InfoSec 2017 will host top cyber security leaders from some of the biggest players in the region such as Stephen Gaudin - US Embassy in Abu Dhabi (FBI Legal Attaché); Ebrahim Hamdan Al Alkeem - Abu Dhabi Systems & Information Centre (ADSIC); Georges De Moura - Etihad (Head of Technology Security, Risk and Compliance – Technology & Innovation); Sandro Bucchianeri - National Bank of Abu Dhabi (Group CSO) and Deepika Batra DiGiovine - GE (CIO- MENAT). Cyber threats are here to stay and growing awareness of their severity must be matched with increased investment in cybersecurity. To avoid financial and reputational losses and stave off even more catastrophic damage types, businesses need to commit themselves to continuous enhancement of their defense strategy. Cyber Resilience & InfoSec 2017 will be held from 6th - 7th February 2017 in Abu Dhabi, UAE. Fleming. connects great people, useful know-how and valuable opportunities. With 12 years in the business and 300+ events organized annually, Fleming. has grown to offer a portfolio of Conferences, Trainings, Exhibitions, Blended Learning and Online Conferences. Present on five continents Fleming. has partnerships to always stay one step ahead. More than 50,000 satisfied companies participating at our events every year prove that Fleming. is the right partner. Sobia Jameel | Marketing Manager | Fleming.